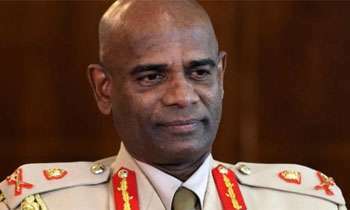 Army Commander Mahesh Senanayake today said in a media statement that as a responsible Army, SLA would not close down Army camps in the Northern Province as alleged by some media reports. “The Army urges the public not to be misled by those unfounded and false media reports, but continue to repose the full confidence in the Army, considering its past services as well as the roles and tasks, now being performed across the country,” he said in the statement. He said; “Under any circumstances the Sri Lanka Army (SLA) will not resort to any decisions that would pose a threat to national security, and it always prioritizes national security concerns, the Army commander said in a statement. Sri Lanka Army is prepared round the clock to respond to all security requirements in the country. During the war, the Army adopting its own structural reforms succeeded in winning the war at that time. In similar vein, the Army while performing a gigantic role in development has thrown its full weight behind the government’s ongoing nation-building projects as the prime mover, the commander said. “However, some opportunistic politicians and mass media organizations, envious of the Army’s commitment to the country’s future are in the practice of spreading malicious and false propaganda in order to inculcate the public with untruth and distortion regarding the ongoing rightsizing process of the Army,” the statement added. “Lieutenant General Senanayake said that ‘right-sizing’ process has always been happening in the Army and had even taken place during the war and also in the post-war period before this one. “Through that, the troops mainly deployed for administrative duties are relieved and mobilized for field duties to gain better productivity, thereby doubling their efficiency. “This process does not allow any Army camp to be closed, but it instead enables the majority of troops in those camps be deployed for emergency disaster needs and nation-building tasks in an effective manner. Nevertheless, some false media reports try to claim that this process has led to a large let-up in the security arrangements in the North and East. It certainly is not a disbanding of battalions, but is only a restructuring with the intention of distributing human and material resources equally among other battalions,” the commander said. Some of those media organizations, operating as cat’s paws of disgruntled politicians, are malicious towards various development projects, being undertaken by the majority of Army troops island-wide under the guidance of the President,” he said in the statement. One would have thought strategic security decisions and the announcements thereof are matter for the defence minister and not the commander, whose input would of course be obtained by the defence minister in making such decisions. That should be a political decision of the democratically elected government. How can you declare that and do you have constitutional power to do so? For the moment you will not remove your 17 divisions of your arm forces.but the day will for UN to force you to remove. Kathrgaman. Since when are we under UN rule? We are an independent country and the UN has no authority to make decisions that effect the country, We are no banana republic to be ordered around by any external body. Who cares about the UN F.... the Un this is our country we should let the Army do what is right and good to all Sri Lankans. The Army is entitled to be present in any part of the country. There should be no 'NO GO AREAS' for our citizens, Law enforcement authorities or National defence forces. Wait and see how true his statements are.Even Panagoda camp can be released to original land owners now. Reviewing the recent statements of Vijayakala and the on going statements of CM Wigneswaran who is an LTTE Surrogate, the Army should not close all the bases in the North. Tri-Forces should not be deployed to discharge the Polce duties , Duting peace time administration.If the Department of Police is incapable and weak, the Hovernment must deal with Department of Police. The Government must not try to humiliate and insult the Tri-Forces by deploying them to perform police duties. What ever politician say about ltte we people - Singles, tails(high case) and others are happy of their elimination. Now take your part to eliminate underworld persons and drug dealers. Make us to live us happy. More than the recent statement of Vijayakala, the ongoing statements and actions of LTTE Surrogate CM Wigneswaran is enough to continue the Army camps in the Northern Province. Even the recent boycott of the Missing persons investigation makes me wonder if those who protested and left is only a drama and not actual persons who lost relatives. Only those who stayed behind appears to be the true persons who lost relatives. This boycott too appears to be a drama of the CM Wigneswaran. Fair amount of damage has already been done. The two retired Army Offcers who were holding the Governor's positions in North and East, were terminated due to no fault of theirs. The removal of army camps in the north is a request by the CM in the north. Why is the north so special to have no army camps? The south has so many army camps. Lets not forget that the country underwent 30 years of civil war. The government can have army camps where ever they want. The Commander is supreme and well said General. Sir, Mind it, you are challenging the LTTE lobby i.e. Sampanthan and CV Vigneshwaran. So 'Hon.' Wimal Weerawansa has been lying all along? Tamils are obsessed with dowry so you are doing right thing. Tamils should get rid of barbaric cultural practices if they want to have freedom. Build a good values within the society before standing up the right. How many Tamil men and their family are riding on dowry which is a indirect slavery because someone have to work for someone to give them money or property. No one in the north is asking army to leave completely,they are only asking to leave the private homes and lands occupied them and spread them proportionately around the country! Sadly no one is not in a position to under stand root cause of the problem.If root cause is solved, no need of campaign. Keep the army, please stop the army from engaging in commercial activities and depriving the people of their livelyhood. This does not help the reconciliation process at all, unless the reconciliation process is just an eyewash. The best is to take the entire three forces to North and East.